In this tutorial, we’ll be taking a tour of the lightweight Java REST framework RESTX. Building a RESTful API is quite easy with the RESTX framework. It has all the defaults that we can expect from a REST framework like serving and consuming JSON, query and path parameters, routing and filtering mechanisms, usage statistics, and monitoring. 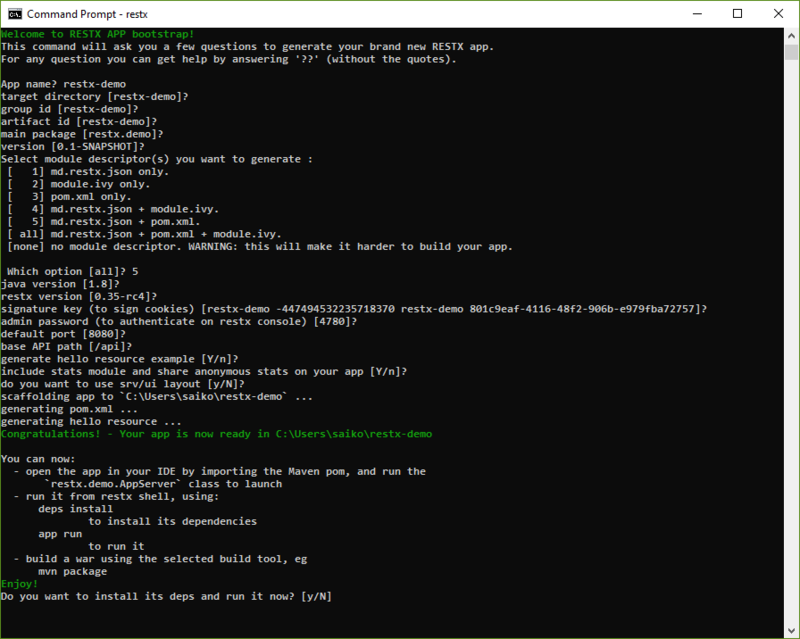 RESTX also comes with an intuitive admin web console and command line installer for easy bootstrapping. It’s also licensed under the Apache License 2 and maintained by a community of developers. The minimum Java requirement for RESTX is JDK 7. RESTX comes with a handy shell/command app which is useful to quickly bootstrap a Java project. We need to install the app first before we can proceed. The detailed installation instruction is available here. Now, it’s time to install the core plugins to be able to create an app from the shell itself. It will then prompt us to select the plugins for installation. We need to select the number which points to io.restx:restx-core-shell. The shell will automatically restart once installation completes. Using the RESTX shell it is very convenient to bootstrap a new app. It provides a wizard-based guide. Since we have chosen to generate a pom.xml, the project can be easily imported into any standard Java IDE. In a few cases, we may need to tweak the IDE settings. Once the build is successful we can run the AppServer class as a Java Application from the IDE. 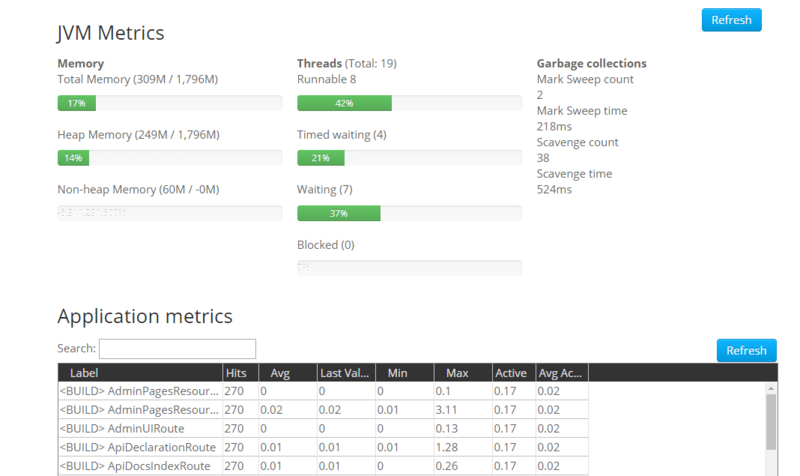 This will start the server with the admin console, listening on port 8080. We can browse to http://127.0.0.1:8080/api/@/ui and see the basic UI. 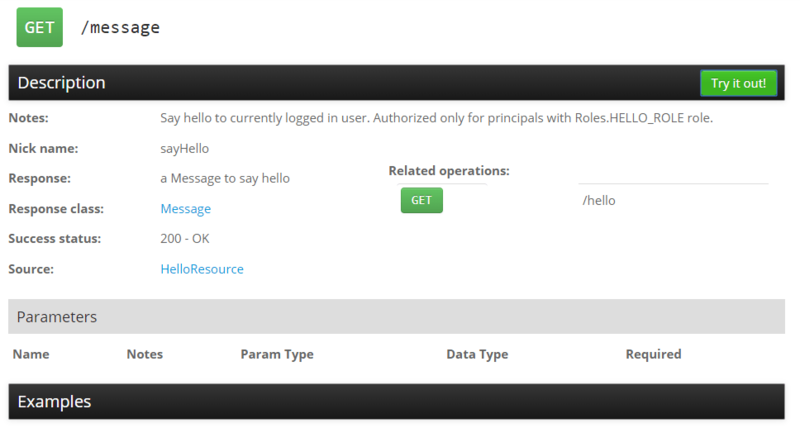 The routes starting with /@/ are used for the admin console which is a reserved path in RESTX. To log into the admin console we can use the default username “admin“ and the password we provided while creating the app. Before we play around with the console, let’s explore the code and understand what the wizard generated. It’s immediately apparent that RESTX uses default J2EE annotations for security and REST bindings. For the most part, it uses its own annotations for dependency injection. RESTX also supports many reasonable defaults for mapping method parameters to the request. And, in addition to these standard annotations is @RestxResource, which declares it as a resource that RESTX recognizes. The base path is added in the src/main/webapp/WEB-INF/web.xml. In our case, it’s /api, so we can send a GET request to http://localhost:8080/api/message, assuming proper authentication. The Message class is just a Java bean that RESTX serializes to JSON. We control the user access by specifying the RolesAllowed annotation using the HELLO_ROLE which was generated by the bootstrapper. As noted earlier, RESTX uses J2EE-standard dependency injection annotations, like @Named, and invents its own where needed, likely taking a cue from the Dagger framework for @Module and @Provides. return new SignatureKey("restx-demo -44749418370 restx-demo 801f-4116-48f2-906b"
@Module defines a class that can define other components, similar to @Module in Dagger, or @Configuration in Spring. 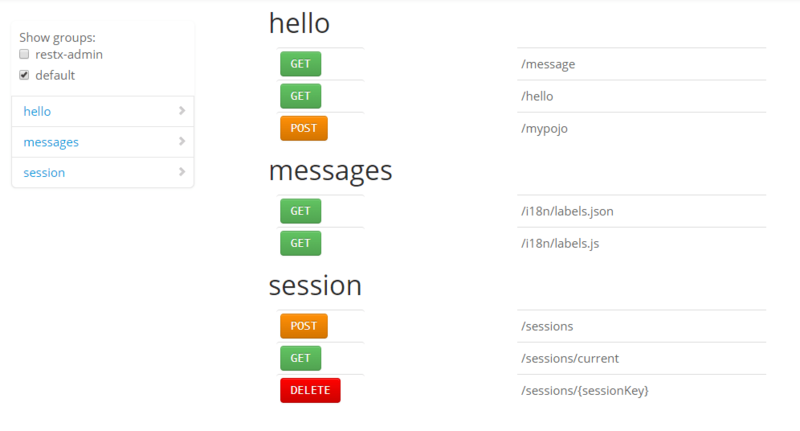 @Provides exposes a component programmatically, like @Provides in Dagger, or @Bean in Spring. And, finally, the @Named annotation is used to indicate the name of the component produced. And check out RESTX’s components factory/dependency injection documentation for more. Here, the dev mode is used during the development phase to enable features such as auto-compile which shortens the development feedback loop. We can package the app as a war (web archive) file to deploy in a standalone J2EE web container. Let’s find out how to test the app in the next section. The test is written in a Given-When-Then structure within a YAML file which basically defines how the API should respond (then) to a specific request (when) given a current state of the system (given). The @FindSpecsIn annotation points to the path of the spec files against which the tests should be run. The spec helps to write integration tests and provide examples in the API docs. Specs are also useful to mock HTTP requests and record request/response pairs. 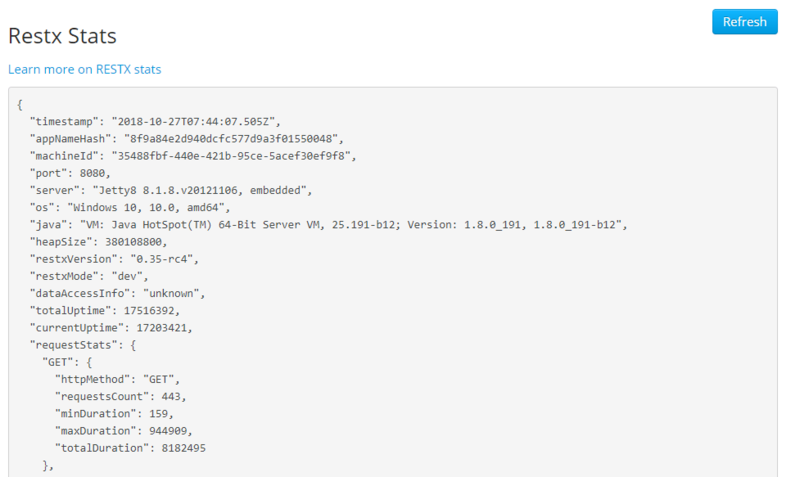 curl -b u1 -c u1 -X POST -H "Content-Type: application/json"
The admin console provides useful resources to control the app. Let’s take a look at the key features by browsing to http://127.0.0.1:8080/admin/@/ui. RESTX lets the user choose to collect and share anonymous stats on the application to give information to the RESTX community. We can easily opt out by excluding the restx-stats-admin module. Because this page shows sensitive information, make sure to review its configuration options. When called without authentication will return a 401 by default. Note that at the class level, all methods are public. With this annotation, RESTX will verify if the authenticated user also has an admin role assigned. In case an authenticated user without admin roles tries to access the endpoint, the application will return a 403 instead of a 401. By default, the user roles and credentials are stored on the filesystem, in separate files. The StdUser class holds the user objects. It can be a custom user class but it needs to be serializable into JSON. We can, of course, use a different UserRepository implementation, like one that hits a database. This tutorial gave an overview of the lightweight Java-based RESTX framework. The framework is still in development and there might be some rough edges using it. Check out the official documentation for more details. The sample bootstrapped app is available in our GitHub repository.